Little remains of the McGaha home along Old Highway 97 after the Carlton Complex Fire swept through earlier this month. Two brick chimneys, crooked and lonesome, rise over the charred wreckage of Brad McGaha and Kelley Ralston's former home. Along Old Highway 97, south of Malott in north-central Washington, other solitary chimneys mark other missing houses like fresh graves in an immense cemetery. Fast-moving fire has stained the hills, blackening miles upon miles of forest and grassland, flashing homesteads out of existence, recasting a valley in destruction. Smoke still hangs on the ridges, flavoring the air with ash. Downed power lines crisscross the barren fields. For 82 years, the McGaha home stood amid a small orchard overlooking the Okanogan River and surrounding valley. Ralston says it burned in a matter of hours. "The house just went up," she says. "It was so chaotic. It was awful." McGaha, 50, says he has lived in the house most of his life. His grandfather built it in 1932. Ralston, 47, a nurse from Seattle, moved into the home last year after they got engaged. While they had closely watched for updates on the approaching fire, the flames crested the nearby ridge with little warning. "At least we were able to grab a few things off the wall," McGaha says of their hurried evacuation. "I didn't have much hope that anything would be there the next day." McGaha says he watched the fire burn from across the river. With roads still closed the following morning, he surveyed the property using a pair of binoculars. Only the chimneys remained. The house, a shop, a barn and four other buildings were destroyed. "It was just overwhelming," he says of the fire. "The sheer power and ferocity of it. ... It's pure fury. It's just hard to explain." Harsh scars now cleave the landscape, hills beyond hills gone black, bearing witness to an unholy spectacle of consumption. Ralston says the community endured a "week from hell," but McGaha notes he has also seen neighbors coming together, tremendous generosity and kindness from strangers. As residents take stock of the damage, many moments have proven both painful and humbling. "I'm just trying to take it day by day," he says. "It's devastating." 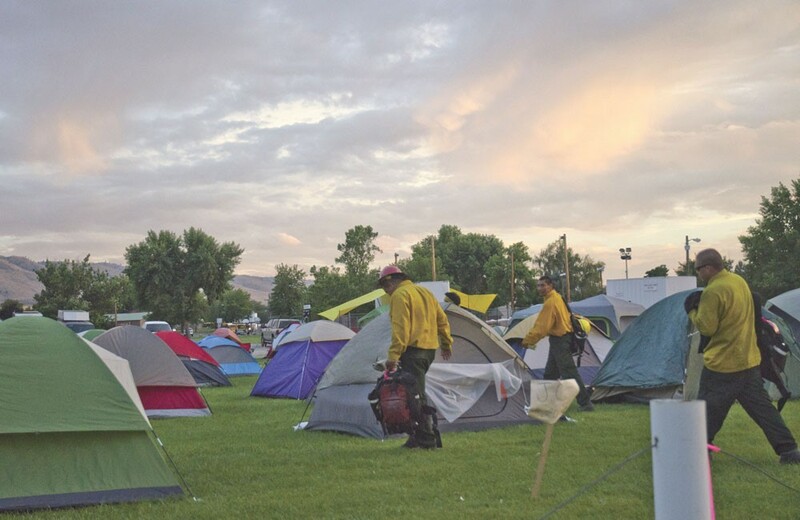 Dozens of tents shelter wildfire crews at a temporary fire camp at the Omak Stampede fairgrounds. Screaming chainsaws drown out chatter along the fire line last week. Branches crack and snap as a yellow-clad fire crew patrols the line, cutting out trees and clearing back brush. The firefighters keep their heads down, their eyes on their work as crew boss Virgil Talks Different walks behind them, calling out directions for widening the remote trail at the base of a yet unburned ridge. "We are getting rid of the ladder fuels," he explains, removing small brush that allows a fire to spread up into treetops. Talks Different and his crew hail from the Fort Belknap reservation in Montana, home to the Nakoda and People of the White Clay nations. They serve as one of 96 crews working the Carlton Complex Fire. With the arrival of last week's rain, crews were taking advantage of the milder weather to reinforce the existing fire perimeter. As of Tuesday, the fire was 67 percent contained. Crews still have a lot of work to do. No fire in the state's history has burned as far and wide as the Carlton Complex Fire, first sparked on July 14 by a passing lightning storm. The immense blaze has now charred more than 250,000 acres in a misshapen, 400-square-mile diamond between the Methow and Okanogan rivers. Glenn Kohler, a wildfire spokesman with the Department of Natural Resources, explains that the Carlton Complex summoned its fury from four separate fires — the Cougar Flat Fire, French Creek Fire, Gold Hikes Fire and Stokes Fire. "It was four little ones," Kohler says, "and then it turned into one big one." Authorities ordered the evacuation of more than 1,000 homes as well as the small communities of Pateros, Brewster and Carlton. As residents have returned in recent days, about 300 families have found their homes destroyed. Countless miles of charred cars, burnt power poles and scorched orchards line roadways. Despite the unbelievable destruction, just one fatality has been confirmed. Retired state trooper Robert Koczewski, 67, succumbed to a heart attack while trying to save his home. It's been 112 years since the state has suffered such a massive fire. Records show the Yacolt Burn of 1902 killed 38 people, destroyed at least 146 homes and blackened 238,920 acres of southwestern Washington. President Obama signed an emergency declaration last week providing federal aid for regional firefighting efforts. The Federal Emergency Management Agency announced it would provide disaster funding to field camps, equipment, tools and mobilization expenses. Officials estimate the fire has already cost at least $23.3 million. Authorities have rallied resources from all across the western U.S. to fight the Carlton Complex, with more than 3,100 firefighters and support workers operating out of three camps on opposite sides of the fire. Separate incident command centers work out of the camps in Omak, Winthrop and Chelan. At the end of each shift, yellow school buses carry fire crews back to their camps. Exhausted men and women shoulder their gear and shuffle to their tents, which pack the lawns surrounding each camp. Some will meander over to mess tents for food. Many will collapse in their sleeping bags, cherishing a few hours of sleep before the next battle. Richard Mathews inspects a decorative metal cutout his son made for him years ago. It’s the only keepsake that survived the fire. Beneath the skeletal branches of a blackened tree in the riverside town of Pateros, Richard Mathews scratches through the ashes of his home with a borrowed rake. A charred oven unit rests by a toppled water heater. Everything else has burned down flat to the foundation. Mathews, 53, bends and picks out a scrap of debris. He examines it briefly and drops it. "That fire was hot," he says. "You know it was hot." 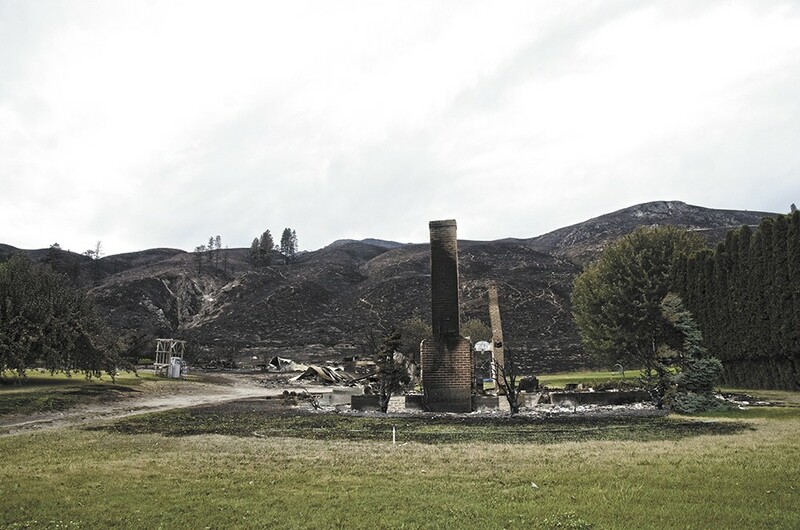 Mathews' home once stood at the center of a family neighborhood in Pateros, population 667, where about 20 adjacent homes went up in flames. Only a tornado could compare to such complete and total devastation. Entire rows of homes lay in waste, reduced to jagged ruin and fine ash. Burnt-out cars line the nearby driveways. An aluminum boat sits melted inside a garage. Smashed porcelain dishes are scattered amid the wreckage. Yet just across a narrow street, the United Methodist Church remains intact — encircled in scorched earth, but untouched. Mathews has started over five or six times in his life, including one previous house fire. He moved to Pateros a year ago, finding a modest house amid a block of family homes, just a stone's throw from the mayor's house, which also burned. He says he had found a new job and settled into a new routine. On July 17, a Thursday, Mathews came home from a long shift at work and quickly went to sleep. He says his neighbor started pounding on his front door about an hour later, around 6 pm. She "almost knocked the door down," he says, and he awoke to find a wall of fire descending rapidly on the town. He grabbed some clothes and photos of his grandchildren, and fled. "I almost got crispy fried," he jokes later, explaining he had just 10 minutes to escape. Residents say they can barely fathom the destruction. So much went to the flames. As media have swarmed the area, neighbors say they have also chased off trespassers caught picking through what little remains in the ashes. 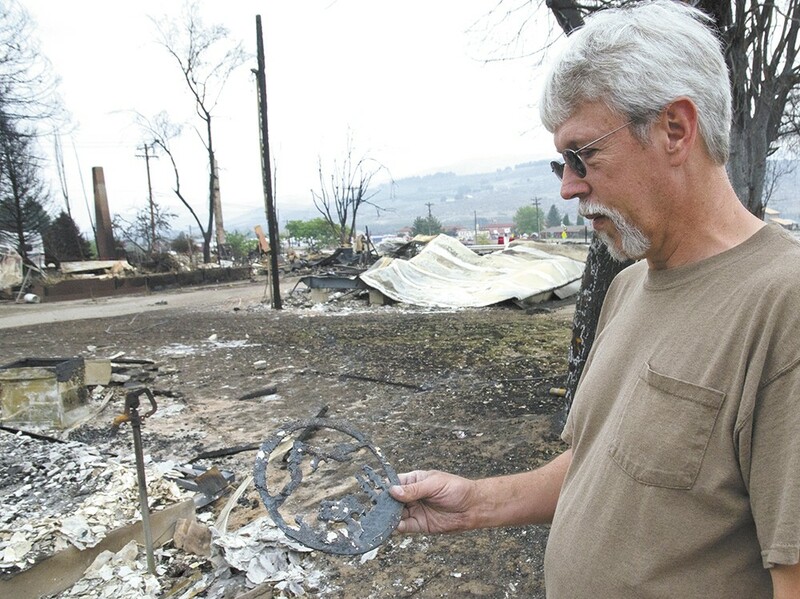 Despite the fire's toll, Mathews considers himself lucky. "I didn't lose much," he says, "just a house." In the days since, Mathews says, a stranger from Tacoma gave him a free motorhome to live in after hearing about the fire damage. So he now has a bed for the foreseeable future, he says, but otherwise he's not sure what's next. He will probably just have to start over again. Mathews came back for one thing — a circular metal cutout of an elk on a mountainside. One of his grown sons made the decorative ring for him in shop class as a teenager. It was the first thing Mathews put up on the wall when he moved into his new home last year. Now, he paces back and forth, raking the wreckage along the wall where the ring once hung. A moment later, he pauses and kneels again. "I found it," he calls in quiet triumph. Melted debris cakes the sides of the blackened ring. Mathews brushes off the cracked and warped edges of the salvaged keepsake, holding it up with soot-stained fingers and a resigned smile. At least he has one small comfort to carry over into his next life. "It's the only thing I could find," he says. "It's not much." 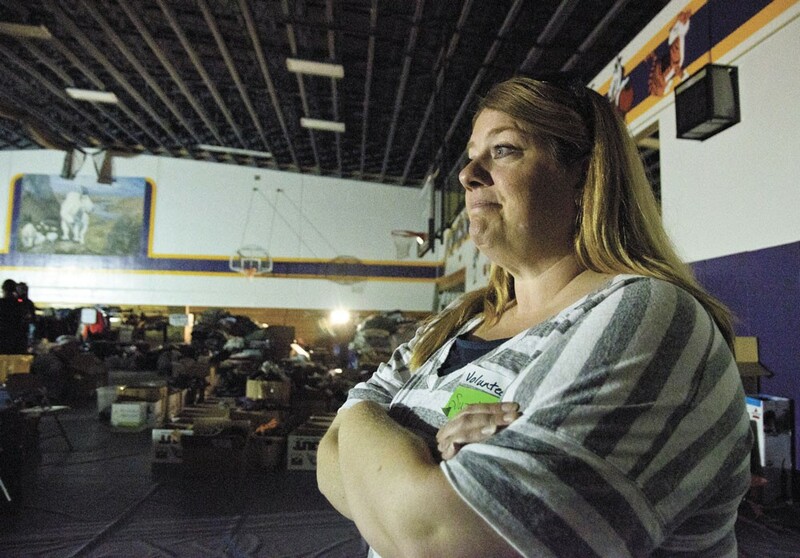 Suzette Ellis, a local relief volunteer, takes stock of the donations streaming into Pateros High School to help displaced residents recover from the fire. In the darkened Pateros High School gym, dozens of volunteers stock makeshift shelves by the light of emergency halogen lamps. Several crowded racks hang heavy with donated clothing. Packages of toilet paper line nearby rows of bleachers. Canned food and camping gear stack high. People hustle through the unlit hallways pushing hand trucks loaded with Gatorade or 40-pound bags of dog food. A mural of the school's mascot, a billy goat, stands sentry over the commotion. Suzette Ellis of nearby Bridgeport welcomes displaced residents, workers and donations at the front of the building. Some volunteers tend massive barbecue grills, cooking for hundreds at each meal. Others inventory and organize the stream of supplies. A few provide childcare or help people charge their cellphones at a temporary power station. "There's about everything in here you could need," Ellis says. 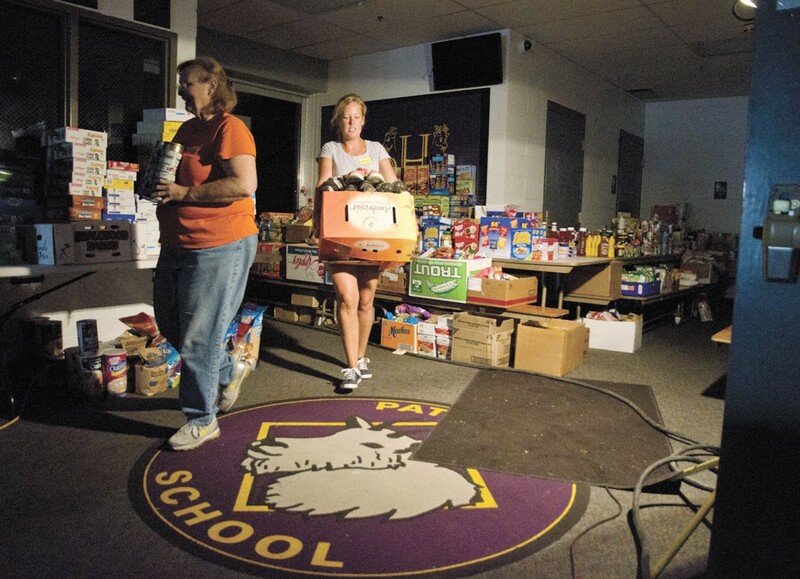 Relief operations started Saturday, July 19, taking over the school as donations poured into the small community. Neighbors have quickly rallied around the homeless, Ellis says, collecting contributions from across the state to help residents recover. "We're doing a lot of basic supplies," she says, like food and blankets. As people get settled, services will shift toward reestablishing homes with donated dishes, linens and children's toys, Ellis says. For now, they're just trying to get people back to some kind of normalcy, trying to provide some light amid all the darkness. In neighboring Brewster, seven miles north, the American Red Cross operates an overnight shelter. Based in the town high school, the shelter invites residents in to eat, shower or use the electricity. It also staffs a nurses' station and mental health counselors to help people process their grief or trauma. Shelter supervisor Lynn Ray walks through the high school halls, peeking into the dark gymnasiums that will likely fill with cots in the coming days. A man already sleeps in the corner of one room. Red Cross workers will rest in shifts, keeping the doors open 24 hours a day. An experienced emergency responder from Santa Clara, California, Ray explains that in most cases, Red Cross arrives after a disaster like a tornado or hurricane has already done its damage and disappeared. She finds it strange to be on-site as the fire continues to burn, still destroying homes and upending lives. Red Cross volunteers have stocked supply stations at churches and schools throughout the burn zone. Volunteers also help provide information updates to passersby. In Winthrop, workers cook up a fresh meal for weary residents, serving taco salad and peach cobbler. One volunteer hands out stuffed animals to the younger children. Once the fire finally stops, Ray and others will shift into "client casework" to help families with recovery, rebuilding and healing. "We're here to serve," she says. Volunteers sort and inventory donations at a relief center at Pateros High School for area residents displaced by the Carlton Complex Fire. Heading north into the Methow Valley on Highway 153, the firestorm has long since passed, but the smoldering hillsides still put off intense heat. Blackened trees form scattered ranks atop the scorched ridges along either side of the Methow River, a glistening current now winding through a smoking wasteland. Wooden fence posts and power poles dangle in the air, suspended by their drooping wires. Deep within the remote heart of the valley rests the namesake and epicenter of the Carlton Complex Fire — the unincorporated hamlet of Carlton, a mountain rest stop with little more than a post office. Jeff Lyman, the 37-year-old owner of the Carlton General Store, stands out front, patiently filling a set of fuel canisters with diesel. "It just started right down the road," he says, pointing south. Lyman says he and his neighbors watched the fire swarm the surrounding hills as dozens of crews staged out in front of his store, packing the highway with fire engines. Hundreds of firefighters flooded the town. Helicopters and tanker aircraft buzzed overhead. Despite a mandatory evacuation notice, Lyman and others stayed to watch over their homes and their friends. "I don't think I slept Wednesday, Thursday or Friday," he says. "We've all been here helping each other." 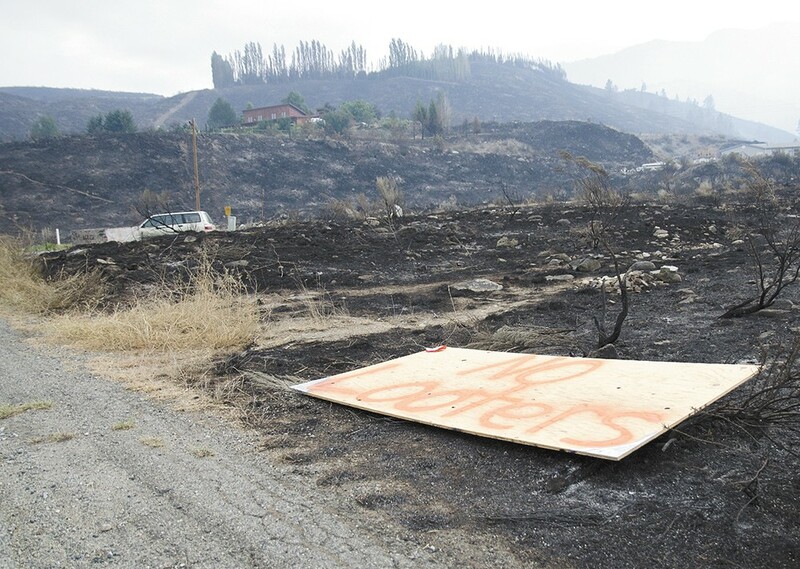 A plywood sign reads “No looters” along Highway 153 in the Methow Valley, where many homes were destroyed by the Carlton Complex Fire. Without reliable power or cell service, residents follow updates on a plywood bulletin board in front of the store, posted with weather forecasts, road closures and a large map charting the size of the fire. Lyman says he has never seen anything like the "crazy" whirlwind of chaos and human perseverance he witnessed in recent days. He says he probably won't ever see anything like it again in his life. "It was ... " he pauses, and gives up. "Speechless. It was unbelievable." In the days since, Lyman has driven the valley to survey the damage. He helped friends take stock of their burned homes. It makes him want to cry. So much beauty turned black, so many lives scarred. But those friends have already started talking of newer, better homes. In the coming weeks, the smoke will clear. The fire crews will head home. The other residents — Kelley Ralston, Brad McGaha and Richard Mathews — will rebuild. And the valley will bloom back up around their homes, new and bright and full of life.